Sustainability is one of the topics of our time. There is no other packaging material that provides better conditions for reprocessing and further processing like metal. 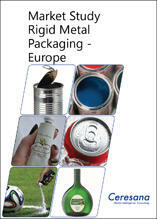 Even today, the recycling rate for metal packaging in Europe amounts to significantly more than 70%. For this reason alone, sheet steel and aluminium are attractive options for many packaging manufacturers as well as for consumers. A high-quality appearance and outstanding barrier properties also ensure a positive image. Nevertheless, rigid metal packaging face a growing competition from other packaging solutions made of other materials, especially plastics. The present study examines the European market for rigid and semi-rigid metal packaging (including secondary packaging and transport packaging). Types of packaging such as cans, tubes, other containers (bowls, boxes, cartons, bottles, trays, canisters, hobbocks, buckets, barrels, IBC’s etc.) are analyzed as well as metal caps and closures. In addition, the study provides information on the development of the markets of those packaging types, split by its respective application areas (soft drinks, alcoholic beverages, food products including animal nutrition, cosmetics, pharma, household chemicals, industry & transport as well as other applications). Ceresana's analysts expect the European market volume for rigid metal packaging to account for around 284 billion units in 2021. Within the last years, the consumption of metal cans for the bottling of soft drinks significantly increased Europe-wide by 4% p.a. In particular the increasing popularity of energy drinks and the introduction of new products, as well as price and recyclability of cans led to this development. The growth in can consumption for beer bottling can be explained by beer mixed drinks that become increasingly popular. According to the forecasts for the future, the beer packaging market appears to experience a shift away from refillable glass bottles to cans. Moreover, the current economic situation in Europe causes consumers to drink less in bars and restaurants but buy more drinks in supermarkets and drink them at home. To a certain level, this phenomenon supports the packaging type metal can. Preserves, fresh or frozen - a matter of budget? Since 2008, canned foods have gained popularity in some countries, due to the economic distortion. Its comparatively inexpensive price and the simple and energy-saving storage are properties that are appreciated anew by many consumers. Thus within the last years, the consumption of cans for food filling increased by more than 1 billion units in Europe. Nevertheless there is a tendency that in more and more countries, preferences shift from canned food to fresh or frozen products that are considered to be healthier. Even though the adapted consumption patterns from difficult economic times will presumably last for a few more years, in the medium- and long-term, we expect a decreasing can consumption in countries in which the disposable income decreased within the last years. Plastic tubes and other plastic containers become increasingly significant as packaging for food like sauces, dressings and condiments. Due to their positive properties, aluminium tubes still hold a strong position in the pharmaceutical field. Thanks to their excellent barrier properties, aluminium tubes protect contents from air and light. Additionally, they hold back volatile components. Aluminium tubes are also resistant to heat. This is crucial to keep pharmaceutical content sterile. Over the next years, the further expansion of Eastern European health systems will continue to support the aluminium tubes market in the field of pharmaceutical products. Also in many other Western European countries, the ageing of the population will cause a growing demand of pharmaceutical products. This is also a benefit for the aluminium tubes market. In particular analgesic ointments will stimulate consumption of aluminium tubes in many countries, due to an increase of age-related complaints such as rheumatism or other joint disorders. Particularly in the beverages segment, glass packaging has become less significant. This development became also apparent with regard to metal closures. In the field of soft drinks, no increase is to be expected. By contrast, the prospects in the wine segment or in the field of cosmetics & pharma are significantly more positive. For a long time, cork wine closures did not have any serious competition. Little by little, plastic closures were used. The current most dynamic development is generated by aluminium screw caps. Besides many other positive properties, they offer high usability as no other aids are required in order to open the bottle. In addition to that, the bottle can easily be closed again. Chapter 1 provides information on volumes of production, import, export as well as rigid metal packaging consumption, each in billion units for the period 2005 to 2021. Furthermore, chapter 1 illustrates detailed information on rigid metal packaging demand at country level, split by individual types of packaging as well as their applications. Chapter 3 provides profiles of the largest manufacturers of rigid metal packaging, clearly arranged according to contact details, turnover, profit, product range, production sites, profile summary, products, and application areas. Extensive profiles of 69 producers are provided, including Amcor Flexibles Europe & Americas, AptarGroup, Ardagh Group, Ball Corporation, Can-Pack, Colep Portugal, Constantia Flexibles, Crown, Greif, Rexam, Sarten Ambalaj, Schäfer Werke, SCHÜTZ, Silgan Holdings and Sonoco Products.